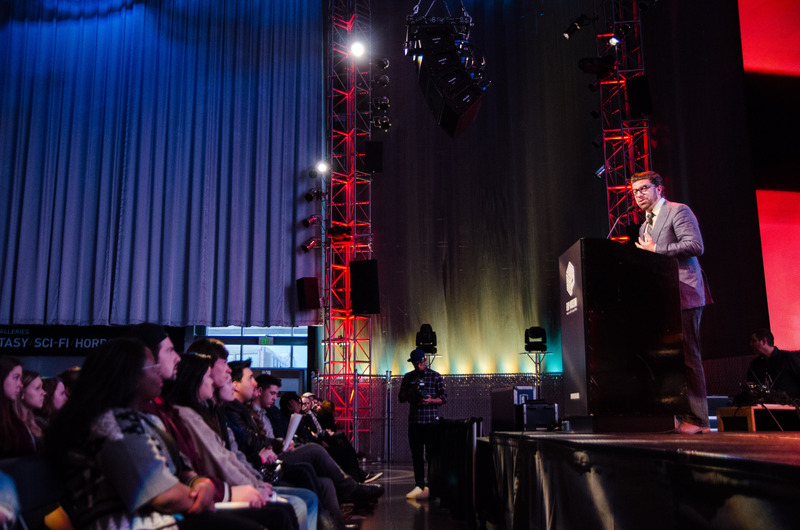 Last month, the Office of Arts & Culture helped to organize City of Music Career Day along with the Office of Film & Music, the EMP Museum, and One Reel. The free, all-day educational event took place on April 22nd at various locations around Seattle Center, providing high school and college students the unique opportunity to learn directly from music industry professionals. The day began with a few introductions from Office of Film & Music Director Kate Becker, Mayor Ed Murray, and Office of Arts & Culture Director Randy Engstrom (pictured). For the Keynote address, KEXP’s John Richards (left) held a lively interview with manager Zach Quillen (center) and hip hop producer/music video director Ryan Lewis (right). Students were given the opportunity to ask questions at the Keynote address and smaller breakout sessions. After the Keynote, the group broke into smaller sessions on more focused topics. At the Artist panel, Dr. Quinton Morris of Seattle University (center) answers questions about opportunities to create music as a career. Larry Mizell Jr., KEXP DJ and columnist for The Stranger, and Emily Nokes, lead singer of Tacocat and The Stranger’s music editor, also participated in the Artist panel. Students listened to members of the Industry panel discuss behind-the-scenes careers in marketing, licensing, retail, artist management, and more. The Tech panel highlighted career opportunities at the intersection of music and technology, such as audio design for video games and user interface for music subscription services. Studio panel participants Vitamin D, Erik Blood, and Moe Provencher (left to right) discussed careers in music production and engineering. At lunch, students had the opportunity to engage with mentors from Seattle-area music organizations and businesses, and after, they enjoyed live performances from local music artists. Above, Seattle Weekly’s Mark Baumgarten (right) interviews Seattle artist Shaprece (left). Shaprece performed with musician Phillip Peterson (left) and producer IG88 (right). Local musician, singer, and songwriter Tomo Nakayama gave the final performance of the day.